Architectural Feature 1. 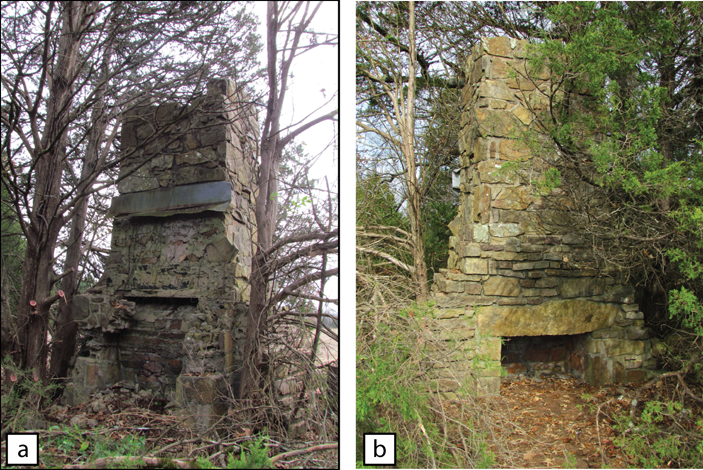 Recreation Hall Chimney (a) the inside hearth (b) the outside hearth. Feature 1. Recreation Hall Chimney. The Log Cabin Democrat on October 5, 1934 states that the recreation center was “one of the showplaces of the camp…. [where] a large fireplace has been built both outside and inside the building.” A large stone mantle once existed over the hearth, but has since collapsed. The outside hearth has a massive stone lintel, which is quite impressive. To date, the internal hearth has been cleaned and artifacts cataloged. The outside hearth has not been examined. Architectural Feature 2. Message Board. The stone menu board sits along in the field adjacent to the former Front Street. It was where daily announcements of duties, news, and the menu for the day’s meals were posted and is a tangible reminder of the day-to-day activities that existed. Certainly, personal items were dropped at the base of the board as men gathered to read the days events and it is our intent to explore that area without disturbing the integrity of the structure. The board features a “grapevine” style of concrete mortar. 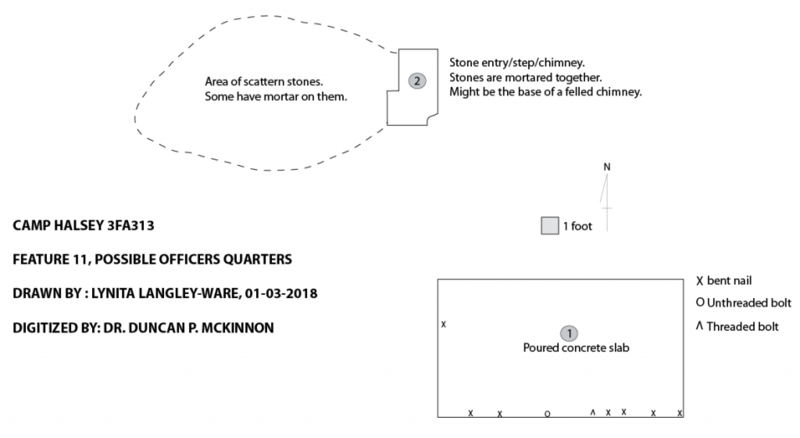 The overall construction and mortar style is similar to the message board at Camp Damascus, a contemporary camp located a few miles to the north, although the Camp Halsey message board is more rudimentary in mortar application and rock placement. This could be the result of an emphasis at Camp Halsey on training skills related to “building terraces, break dams, and drainage ditches” rather than on mortar construction. 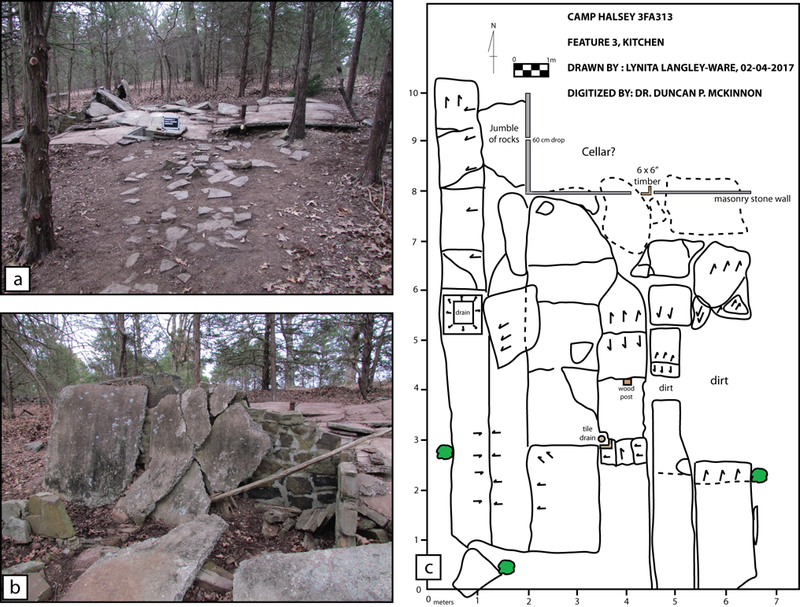 At Camp Damascus, it is suggested in the National Register Nomination that rockwork “could be considered ‘busywork’ or practice work for the men at the camp”. Perhaps the same could be considered at Camp Halsey. Feature 2. Message Board (a) The front face of the message board (b) thickness of board (c) grapevine mortar style. Architectural Feature 3. Kitchen. A September 1934 record of buildings describes the kitchen as a 1-room addition to a 2-room mess hall. The kitchen is listed as having a water connection, but no sewer connection, at least at that time. Leading from the foundation is a possible former pathway. A 1934 mention in the Log Cabin Democrat refers to “soapstone and shale” sidewalks laid by the enrollees. The exposed rock nicely leads in the direction of the recreation hall and may have connected the two. The exposed kitchen foundation measures approximately 10 meters or 32 feet north-south and 6.5 meters or 21 feet east-west, which matches with the building inventory dimensions of 32 feet x 20 feet. It is listed as rigid frame type of construction. At present, we believe the 2-room mess hall was attached to the south of the kitchen and a cellar was to the north. Two sinks drained into a single drainage basin located on the west side. Feature 3. 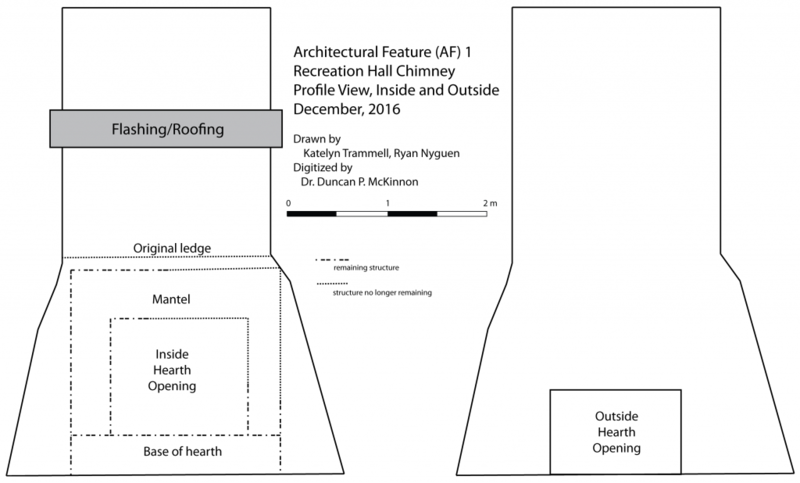 Kitchen (a) exposed walkway leading from kitchen (b) possible cellar (c) sketch map of kitchen. Top, Looking west out the garage car door entrance. Bottom, looking east toward the back of the structure. Architectural Feature 10. Automotive Garage or Shop. During the 2018 UCA Archaeology Field School, a significant portion of Feature 10 was exposed and artifacts collected. The feature contains a short concrete knee wall around the outside with two entrances on the east end. A proposed car door is present on the west end of the structure. The floor is hand-poured concrete that is mixed with local shale and sandstone. Small fragments of broken objects (glass and metal) are also mixed with the cement. Most of the artifacts collected from the feature are automotive parts. 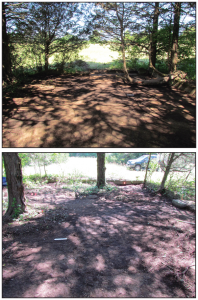 A large midden exists on the northeast corner, although it was not completely excavated. Architectural Feature 10 plan map created by UCA students during the 2018 field school. Architectural Feature 11. Possible Officers Quarters. Feature 11. Possible Officers Quarters.